This Julia Child’s classic is easy, simple and elegant. Suitable for a weeknight (it’s ready in 15 minutes! ), it’s also fancy enough for guests and should be a staple in your cooking repertoire. As always, look for sustainably caught or raised fish. Sole is a mild, light fish so pare with delicate flavors – think couscous with haricot vert or other spring greens. 1. Spread the flour evenly in a wide shallow dish. Rinse the fish then pat dry. Sprinkle both sides with salt and pepper, then dredge through the flour, shaking off the excess. 2. Heat oil in large skillet over medium-high heat. When oil is shimmering, add the butter to the pan. Let the foam subside, then add fish – two filets at a time – and cook til golden on bottom, about three minutes. Using a large spatula, carefully turn the fish and cook another minute or two, until opaque in the center. Remove fish from pan and cover loosely with foil. Repeat process with remaining filets. 3. 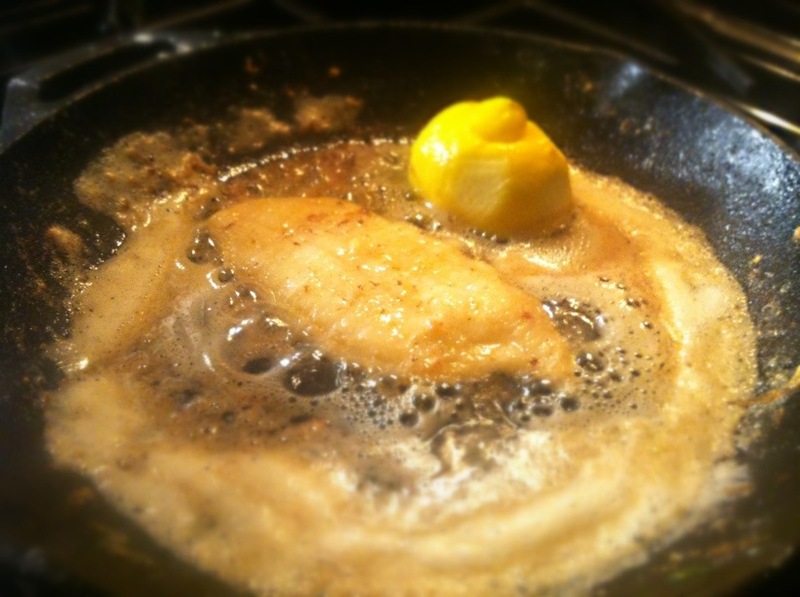 When fish is cooked, pour drippings from skillet, then place pan over medium-high heat. Add in the butter and cook 1 to 2 minutes til melted golden. Remove from heat and stir in parsley and lemon juice. Pour over fish and serve immediately, garnished with lemon wedges. Just made this. Amazing and so easy. Will be added to the regular rotation! Thanks for sharing! !